Includes 5x Stickers with 2 years coverage. Each sticker set comes with 5 convenient stickers 3x smaller stickers plus 2 larger stickers. Statistically, over 30% of Americans lose their mobile devices every year. Most commonly we leave our phones or electronic devices behind at restaurants, taxis, changing rooms, top of your car, airports, bus or subway, when on holiday and at the shopping mall. Has it happened to you? Most likely it has! SuperSmartSticker’s come in a set of 5x high quality vinyl water proof stickers which are ultra thin and highly durable. Simply stick them on the back of your ipad, phone, camera or laptop etc for more protection. 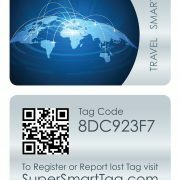 Each sticker has a unique tracking Smart Code just like our luggage tags. 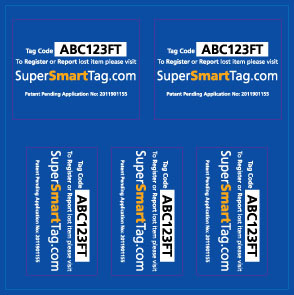 Each sticker includes 12 months global coverage from date of registration. 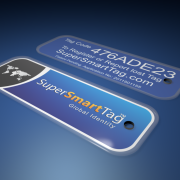 The unique SuperSmartTag code which is found on the back of every sticker, protects your privacy. EVERY STICKER HAS A UNIQUE ID CODE! MAKE YOUR ITEMS STAND OUT!